Be Tough on Your Stuff! What starts out as saving the green planter that we got on sale for some new plants typically ends up with it somewhere half-buried on the side of the house or on the shelf in the garage, along with the other “worth keeping” items. It happens to many of us…Our stuff grows…. and grows! And before we realize it, it becomes the beast that we don’t want to tackle – mostly because it is so big and daunting. We just don’t know where to begin. I promise you that your time and effort will definitely be worth the reward. Your property will show significantly better with some organization and decluttering. When prospective buyers get to see more of your property they get a greater comfort level about its condition and what it has to offer! Pick a day and amount of time you are willing to dedicate toward doing this. It can be 30 minutes or 3 hours. Every bit moves you in the right direction. Make it a family event. For example, everyone can be in charge of their own room. 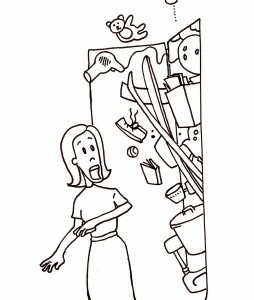 Hire a helper…A good handyman can be very useful in helping organize and clean out. Many times sellers don’t fix things, upgrade items or replace what’s needed because they get overwhelmed and they think it’s going to cost a lot. So the tendency is typically to hold off doing it. One of these items is replacing carpet. If your carpet is stained beyond what at a carpet carpet cleaner can take care of or is so torn that buyers are tripping on the shredded ends, then it is a good idea to go ahead and replace it. P.S. Just go neutral on the selection. This time I want you to check out your air vents. 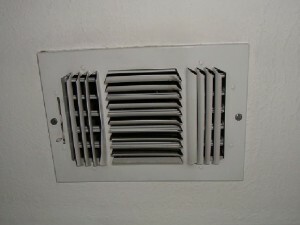 These vents allow the air from your AC/Heating system to filter into a room. They are typically attached to your ceiling where the ductwork opening is located. It’s important to periodically look up and see if they and/or the ceiling around them is dirty. In this case, it’s both! 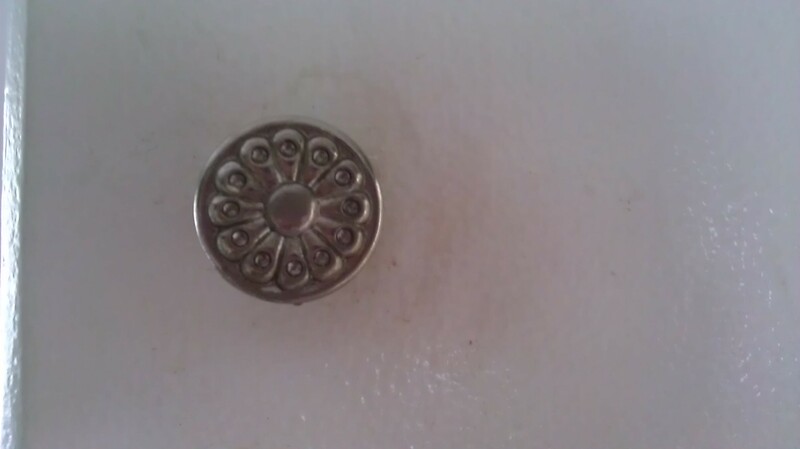 But after a simple wipe down of the ceiling and vent….. 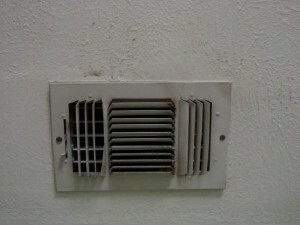 This is an important item to address because when buyers see dirt on and around your vents they get concerned about your AC/Heating system as well as the condition of your ductwork. This is one of those deep clean items I mention in my book that you should take care of before your home hits the market. If you want to go a step further, get your ductwork professionally cleaned. Just don’t forget to tell the buyers. It’s a great selling point! Light In; Everything Else Out! 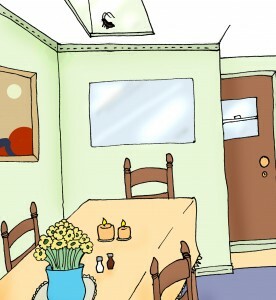 If you haven’t noticed, it’s the dead roach in the skylight! When prospective buyers are looking at your home they are looking everywhere – down, around and up. It’s important to keep skylights clean and clear of any debris or stains. Otherwise, buyers get concerned about it. If you’ve had a roof leak, (which is common) get it repaired and painted back to its original condition. 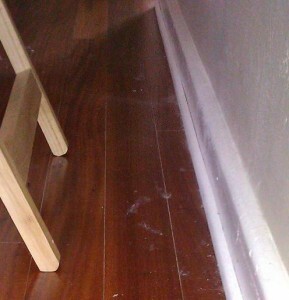 When buyers look up and see a brown stain on a ceiling, they assume it is a current leak. Don’t let them think that! Last note, get the right person for the repair job. If your roof is leaking, get a licensed roofing contractor. If you have a dead bug or other debris in your skylight, you can probably do it yourself or get a good handyman to clean it out. We all have a cabinet or two that we open more than the others. noticeable dirt builds up over time. This is easy to miss because we’re not always looking directly at it. 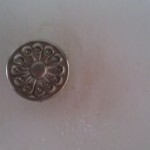 Be Aware of the Wear! It’s easy not to notice that the bathmat you step onto every morning may need to be cleaned too. They don’t just get your shower clean feet on them. Bathmats also get dirt and debris from people coming in the bathroom throughout the day, paw prints from Fido plus whatever else that gets spilled and dropped on them. The Only Bunnies No One Likes…. 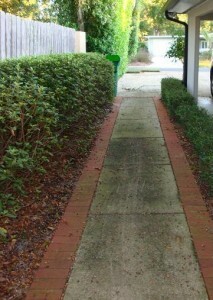 If I had to pick one thing in my book that is my favorite item and that I believe has a huge impact on how your property shows it would be pressure washing your driveway, walkways and patio areas. 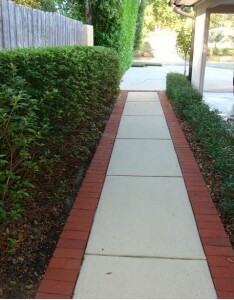 It not only gives those areas a clean like nothing else, but it also gives your property a “WOW” factor! The nice thing about this task is that you don’t have to purchase expensive equipment to get the job done. Many hardware stores rent out pressure washers. Ask your local real estate agent where you live for a recommendation. Who is Cleanest of Them All? Hopefully, it’s your mirrors on your walls! Though they can be in any room of a house, it’s usually our bathrooms get the noticeable build-up of daily hair products spray, accidental toothpaste squirts, mascara markings and who knows what else. Moreover, mirrors are one of the everyday things that we look at so often we don’t usually see what is staring back at us. So make an intentional effort to look, not at yourself, but at the mirror itself. This one gets overlooked all too many times. It’s your toilet. It should be completely closed, which takes less than 5 seconds and completely cleaned, which takes less than 5 minutes. 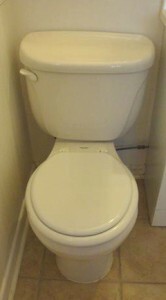 This is really the only way someone wants to see your toilet.